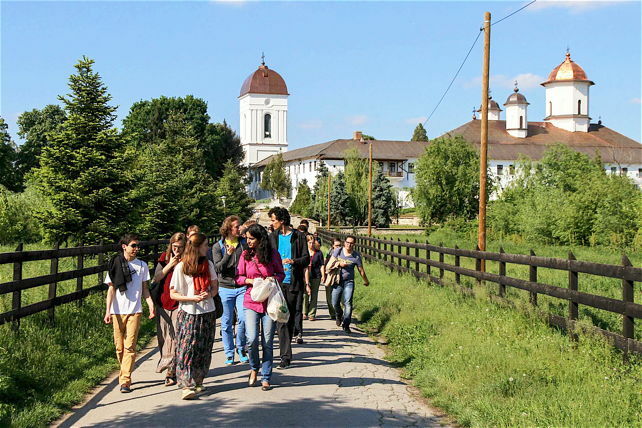 Young people who took part in the International Easter Pilgrimage in the Orthodox parishes of Bucharest have sent us echoes of their experience. We publish a selection of them here. There is also a page with more pictures from the pilgrimage. When I arrived, I was warmly welcomed at the airport and then at the Theology Faculty, in my host parish and by my host family. And I entered my first Orthodox Church on Wednesday in the evening. It’s a very beautiful, small church with paintings and icons and gold everywhere. I was impressed, but it was not what I had expected. Then the service started. And the music was also not what I was expecting orthodox music to be. It was beautiful but I felt foreign and out of place. During the last few days I had so many interesting discussions. The first was with an old lady in front of the church – she could not speak English or German and I don’t speak Romanian so we used our hands and feet. She told us to make the sign of the cross in the correct orthodox way and showed us the difference from the western way. The next meeting was with the two priests in our host parish. We discussed the differences and things we have in common using symbols in the church and we had a guided tour of our host church. I also talked to the guide during one of the workshops. And now, two days later when the evening prayer started and the parish began to sing it felt like home and I even tried to sing with them. I could not pronounce a single word. But there were friends around me in this beautiful church with a beautiful atmosphere. The hospitality in Bucharest is awesome. The time of Lent is strict in Romania, because of the Orthodox Easter that we celebrate on Sunday. But Lent doesn’t mean that you don’t eat – It means you get a lot of vegetables and food without milk products. And the host families are very kind! Our host mother only speaks a little French and Romanian. The only sentence she doesn’t understand is ’can we help you?’ Body language is a language that everyone speaks so we manage very well! 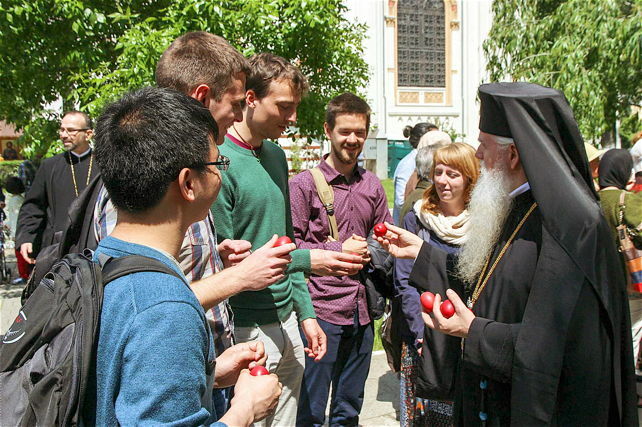 I’m really thankful for the time that I can spend in Romania and to be able to celebrate the Orthodox Easter together. On Good Friday, you go into the church with all the feelings left behind from the previous night’s Gospel – the Passion narratives. Everything is decorated with flowers that people have brought during the day and really looks joyful, and at the same time you hear the priests reading the Lamentations and you can barely understand the complete desolation in the people’s hearts, but at the same time you know that all this had to happen... for you. The procession that follows is both extremely solemn and silent but also mirroring the Resurrection procession. Everybody enters the church for the second time and you can already see the white curtain with "Hristos a înviat" (Christ is risen). You know that it is near, and yet you know that you have just taken part in the Saviour’s funeral. The Good Friday service is a weird point in time, with a foretaste of the Resurrection. On Good Friday we had the opportunity to visit the “Saint Panteleimon” parish. Again I was overwhelmed by the Romanian hospitality, the very warm welcome from different people: the priest who explained the meaning of their Good Friday service; Julia, the head teacher of a school, who spoke so passionately about being a teacher and how she finds God in the children; Ruxandra, a twelve year old girl, who amazed me with her excellent English but even more with her bright, welcoming smile; the director of the palliative care centre who does her difficult job with so much warmth. All these encounters showed me that, although we have a different style/form of worship and we might not understand all of each others’ rituals, we are all searching for God; and that the people I met also think that God is love! In Bucharest on Good Friday most people came to the church with flowers. I could not understand why, on such a tragic day, people bring flowers and put them in front of the cross. At the end of the evening liturgy the Priest said that each person would receive flowers as they left the church – those that people had brought today – and that they should keep them until next Easter, as a symbol of love. Christ is Love, He died on the cross so that we might have eternal life – it is not about death, but only about Love. And standing in front of a large cross on Good Friday we, who believe in Christ, can see the cross in the light of the risen Christ, and not as a sign of humiliation. 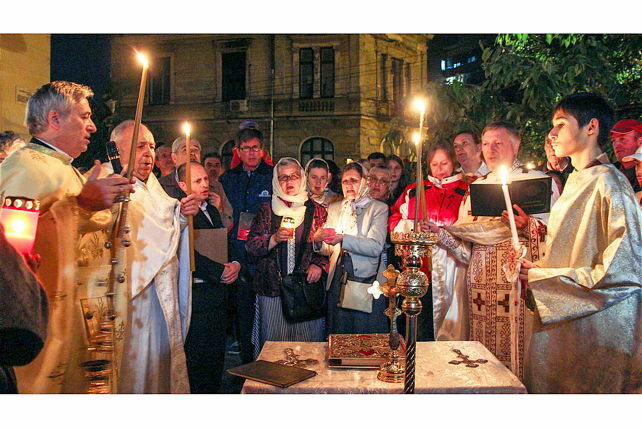 Here, in Bucharest, Good Friday was for me a great hope and witness of the boundless Love of God for people, witnessing that Christ has beaten death and fear. 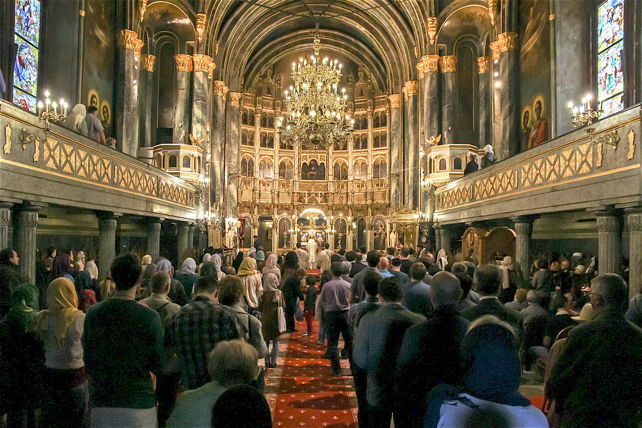 Being in Bucharest at the time of Lent and joining orthodox people in their prayers and everyday life was a very unique opportunity to see what their faith and Easter traditions look like. It was amazing how open they were and that they want to spend this special time with us. Not only by inviting us to their homes but moreover by sharing their faith with us. Coming to Bucharest meant experiencing a completely new level of what being welcomed could mean. Our host mother opened not only her doors, but also her heart for us and generously shared her life without hesitation. The orthodox prayers and the beauty of the songs showed me very clearly that the most precious things can be better understood with the heart than with the mind. For some time I’ve been very interested in the Orthodox Church and its traditions. But most of what I’ve seen is Russian Orthodox. So Romania has opened my eyes to how to look at a church building, and more specifically an Orthodox Church. Where the Russian churches are all square, Romanian ones are built in the shape of a cross, facing the east. I also got a lesson about the design of the Icons. For instance, an Icon of the virgin Mary could hold baby Jesus with the right or left hand, or with both. Details I never looked at. Above the exit of the Church, in Russian orthodoxy I’ve seen Icons of the last judgment, whereas there are Icons of the founders of the church in Romanian churches. So many small details I’ve learned, that together with the hospitality of the Romanians made my experience great! Thanks to all the parishes which welcomed us. These experiences lived together will remain in my heart always. It wasn’t my first time in Bucharest but I can say that I learnt and saw more than before. 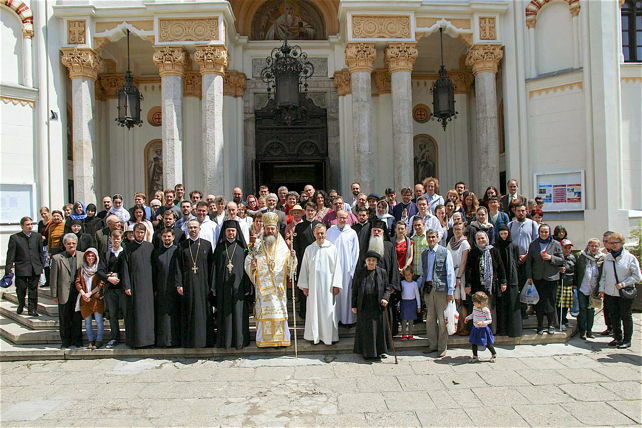 Taking part in this pilgrimage was one of the best choices I ever made in my life: coming to discover Romanian culture. I live in Romania, though I’m part of the Hungarian minority living in Transylvania, the North-Western third of the country. In my community we celebrate Easter according to the Catholic rite and date and so I had no idea about Orthodox celebrations. I had just heard from my friends that it is very long! I was very curious and wanted to see for myself what it is like. I spoke a lot with my host family in Bucharest and learnt a lot of new things about their tradition. It was easy for us to understand each other, because I also speak Romanian – but I also think it’s not completely necessary to have a common spoken language. As I learnt when I spent a week in Taizé, in France, it is enough if you use body language or just try to say some words and everybody understands you. When we arrived to our host Parish we were warmly welcomed by the priest and our hosts. They were very open-minded, kind to us and opened their homes to foreigners, people they had never seen before, but somehow there was a mutual trust in each other. On Good Friday we had the opportunity to visit the parish "Saint Pantelimon". Again I was overwhelmed by the romanian hospitality, the very warm welcome from different people: The priest who explained the meaning of their Good Friday service; Julia, the head teacher of a school, who spoke so passionately about being a teacher and how she finds God in the children; Ruxandra, a twelve year old girl, who amazed me with her excellent English but even more with her bright, welcoming smile; the director of the palliative care centre who does her difficult job with so much warmth. I think I have just about recovered from the meeting (although I still have the Taize Bucharest 2016 signs in my car!) Personally I found it an amazing experience to help organise this pilgrimage in my own city. It was a great pleasure to help with everything - I would do it all over again anytime! I was personally impressed (among a lot of other things) by the great respect for the Orthodox tradition shown by the pilgrims. For example the girls wearing long skirts and covering their heads during the prayers or when they went into a church. Also all the pilgrims that I talked to were really impressed by the Easter preparations in the families, it was something very new to them and they really enjoyed doing it. The volunteers from the city who had never heard about Taizé were a bit shocked - in a good way - about what was going on, for them it was the first time to discover "the Taizé spirit", and it was a really unique experience for them.